Brief: American work clothing giant Dickies runs the annual UK Worker of the Year competition for British workers in all categories of work and across all industries. 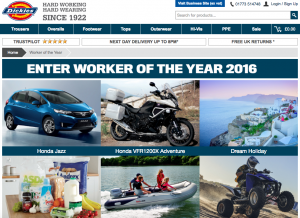 Working with Dickies’ PR Company Chicane, I was asked to set-up the online profiles for the UK Worker of the Year @UKWOTY and run a campaign promoting the competition to maximise the number of visitors to the competition entry website. Delivery: I set up online profiles for UK Worker of the Year and Dickies on Twitter and Facebook and managed a six month community building campaign to promote the competition. This campaign had the sole aim of driving prospective entrants to the competition website. I wrote blog posts, created and ran small competitions on Facebook and Twitter, and kept interest going with regular funny and chatty Facebook posts, and tweets. The campaign doubled the number of visitors to the site from the previous year.